If you have not yet tried out JT65A, I'd like to introduce this digital mode to you. The links, below, give the technical and operational details. Have you ever wondered how much of the noise you hear on the HF bands is actually comprised of signals too weak to be copied? JT65A is a weak-signal digital mode that allows you to pull great DX out from under the noise on the high frequency spectrum. The JT65A communications protocol was conceived and first implemented by Joe Taylor, K1JT. Joe, a Professor Emeritus of physics at Princeton University, shares a Nobel Prize with Russell Alan Hulse (ex-WB2LAV) for the discovery of the first pulsar in a binary system as well as the first confirmation of the existence of gravitational radiation in the amount and with the properties first predicted by Albert Einstein. Joe has contributed to the amateur radio community in much the same way, changing the playing field for weak-signal operation. JT65A is actually a "sub-mode" of Joe's original JT65 protocol, which he designed to optimize EME contacts on the HF and VHF bands. 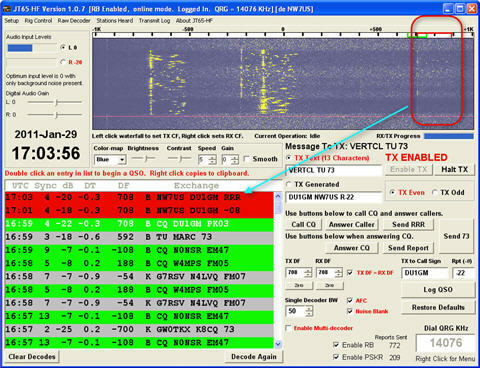 JT65 includes error-correcting features that make it very robust, even with signals much too weak to be heard. It was later realized that this protocol, with some adaptation, would also be very usable for terrestrial HF communications. For field day I got a Demo of JT65 from the guys at W7ASC. It was a lot of fun! How cool! I am not certain how many FD sites ran JT65A, but it is not inconceivable. My JT65A page includes the technical details, in terms of running the mode. I co-authored a two-part series on the mode, and the PDF files are on the page to which I linked, in my first post. Perhaps you'll try it out, sometime. I'll keep my eye out for your call. I will download the PDF's. I plan on setting up a tigertronics USB sound card interface for my FT2000. I am really interested in all of the digital modes and packet software.